This year’s Vale Earth Fair, which takes place at the Vale Castle on Sunday 24th August, will see the legendary urban electronic dance act Freestylers headline the long running music and arts festival. 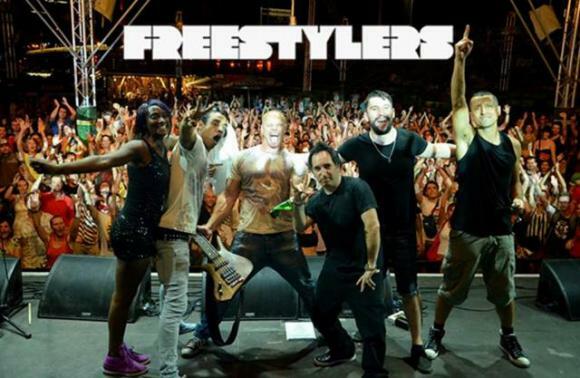 As a live act the Freestylers are joined by long time ‘band’ members MC Sirreal and Valerie Maxfield, both vocalists, Dave Budgen on Bass, Sam Edwards (Drums) & guitarist Tony Ayiotou. This original line up has played to notoriously massive home crowds at UK fixtures such as Glastonbury, Reading and Leeds. They’ve also booked coveted live shows around the globe; performing at MTV’s Times Square Millennium Party, wowing ‘Big Day Out’ crowds with high energy show’s in Australia, and fitting right into a notoriously ‘rock’ domain at the diverse LA festival ‘Weenie Roast’, sharing the bill with some of the world’s biggest rock acts Red Hot Chilli Peppers and Queens of the Stone Age. US artist Lenny Kravitz also personally invited the band to be support act on his ‘American Woman Tour’. The Freestylers high octane live performances has earned them awards for best live band amongst others and earning them the reputation as one of electronic music’s most celebrated acts ever, not to mention holding a cheeky ‘record’ as the first ‘Electronic’ act to be asked to perform on the iconic British music show ‘Top of the Pops’. The Freestylers began their career as an urban electronic music act and their early tunes ‘B-Boy Stance’, ‘Ruffneck’ and ‘Warning’ set the marker. As their music has progressed so have their anthems. In addition to their status as underground heroes, they have gained commercial success with their global hit ‘Push Up’, and have had their music synched in numerous films and TV commercials. “We’re really excited to have the globally renowned Freestylers playing at this year’s Vale Earth Fair” said Vale Earth Fair Collective member Rob Roussel, “and there’s a great selection of other acts also being lined up for the festival”. Other acts already confirmed for the Vale Earth Fair include Manchester Hip Hop collective ‘The Mouse Outfit’, ‘Attila the Stockbroker’s Barnstormer’, and ‘Dead Sea Skulls’ from Birmingham. Profits from the Vale Earth Fair are split between the humanitarian organisations the Burma Campaign UK, Free Tibet, and Bridge2Haiti. If you want to learn more about the causes the Vale Earth Fair supports, information is available at Vale Earth Fair fundraising events, and there are links on the website: www.valeearthfair.org. Advance tickets at £15 + £1 Admin fee are already on sale on the 'Tickets' page.